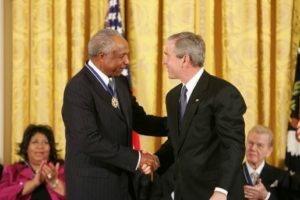 Baseball, and America, lost a true hero Thursday when Hall of Famer Frank Robinson died of bone cancer at age 83. Robinson was a hero, not just because he was one of the best baseball players ever, which he was, and not just because he was Major League Baseball’s first black manager, but because he did it all with such grace, dignity, and integrity. The pressure was intense when he took over as player-manager of the Cleveland Indians 1975. Yet, he plowed ahead with legendary focus on the game itself, neither loudly trumpeting nor running from all the questions about his blackness and his, well, firstness. To be 11 years old and watch this unfold, as I was and did, was to see how a strong gentleman should conduct himself, and to learn from and admire it. Of course his playing statistics were almost otherworldly, especially because the first part of his career was played in an era when offensive numbers were depressed because pitchers, using a higher mound than today, tended to dominate. When Robinson retired, his 586 home runs were fourth all-time behind Hank Aaron, Babe Ruth, and Willie Mays. That’s fine company. He was one of only 16 players ever to win the Triple Crown, leading his league in home runs, runs batted in and batting average in the same season. And his career wins above replacement, a key modern baseball stat, of 107.3 significantly outperformed more celebrated near contemporaries such as Roberto Clemente, Reggie Jackson, Willie McCovey, Ernie Banks, and his longtime teammate Brooks Robinson. On the surface, his managerial record was less impressive, a career record of 1,065-1,176, but he usually led teams without much talent. The best measure of his galvanizing effect on a young squad came in 1989, when he won the Manager of the Year award for taking a Baltimore Oriole team that had gone 54-107 the previous year and leading it to an 87-75 mark.